Never underestimate the geek value of a night at the museum, specifically New York’s Museum of Modern Art. 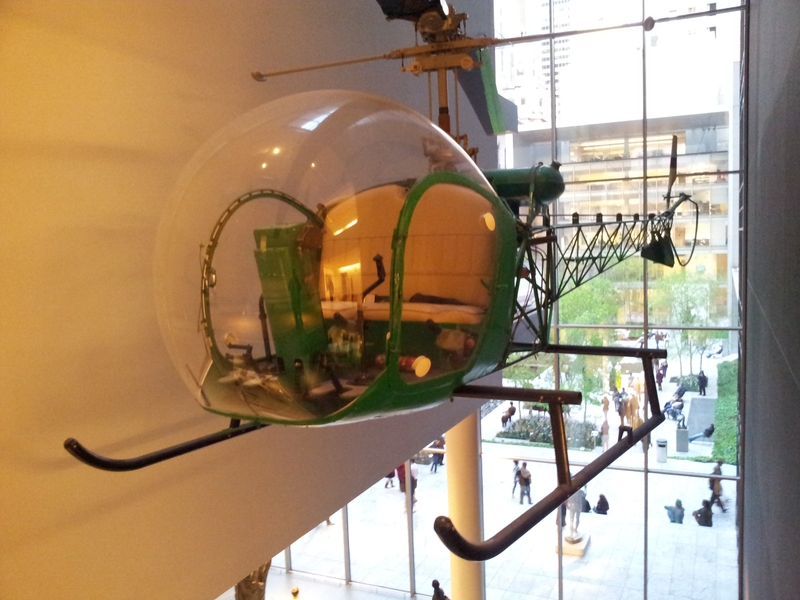 On a recent Friday afternoon (admission is free 4 p.m. to 8 p.m. on Fridays) I found myself on the third floor where MoMA houses a surprisingly eclectic and entertaining collection of old and new technology in its Architecture and Design areas. While the Bell-47D1 helicopter in the lobby and the collection of vintage vacuum tubes were expected, the displays also include products you may have used or may be in your home right now. The FPR2 Human Powered Radio and Freeplay Human Powered Torch from Freeplay Energy Ltd. would have come in handy during any of New York’s three major blackouts. Both units can be charged with elbow grease or via built-in solar panels. 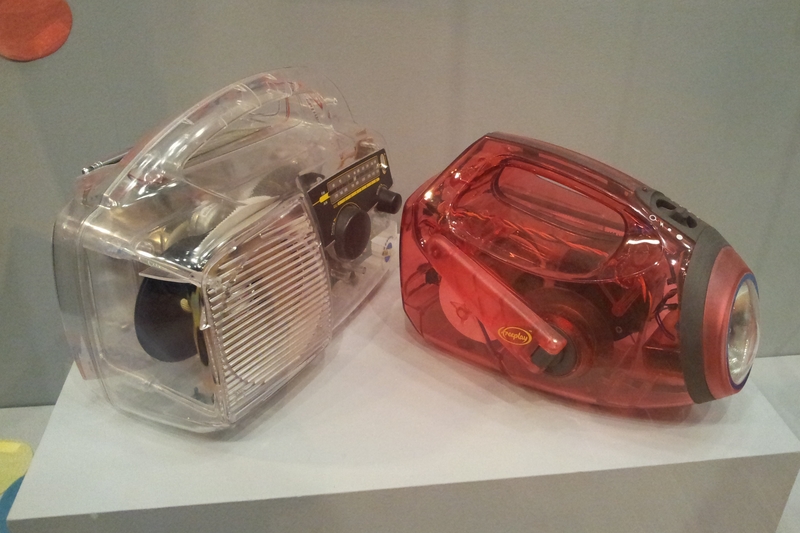 The London-based company still makes hand-crank-powered devices but they’re smaller and sleeker than these translucent 1998-vintage consumer products. The IBM ThinkPad 701 notebook, which debuted in 1995, is a classic example of cool technology which went white hot and ice cold almost overnight. How do you fit a full-size keyboard into a compact laptop? Create a split keyboard which expands when you open the unit’s lid and collapses when you close it. The butterfly keyboard, officially called the TrackWrite, allowed the unit’s 9.7-inch-wide case to accommodate a keyboard that could fold out to 11.5 inches wide. As laptops grew larger and more affordable, the need for such keyboard magic disappeared and the ThinkPad 701 ended up as the only ThinkPad made with the nifty folding keyboard. Long before frills such as wireless mice, studio-quality audio or (gasp!) electronic displays came to personal computing, Olivetti’s Logos 80 Programmable Calculator provided a reasonable calculating option for those graduating from slide rules or four-function pocket calculators. It’s not surprising when art makes its way from a museum for temporary display in the New York’s subway system, but it’s rare when things go the other way. The Metropolitan Transportation Authority, the folks who run New York’s subways, is experimenting with the Help Point Intercom, a highly visible customer assistance and emergency communicator. Many stations have customer communication boxes, but they’re yellow and much smaller and sometimes hard to find. The Help Points are much larger, always illuminated and are uniquely coded so subway personnel can tell which unit was used to call in an emergency and where to send assistance. In a pilot program, some units have been installed at the 23rd St. and Brooklyn Bridge stations on the Lexington Ave. line. 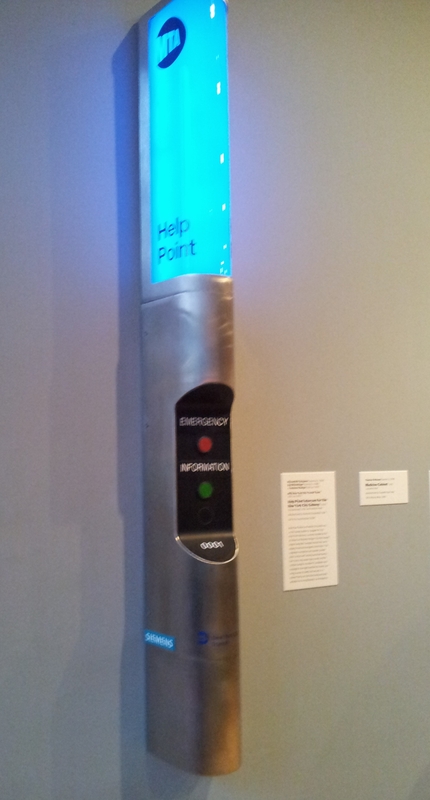 Apparently the sleek, but functional design earned the Help Point a spot in MoMA even before it merited widespread adoption in the subway system. The moral of this story: Cool design is timeless. Only time will tell if the electric toothbrush you used this morning will make it to MoMA’s third floor next year. Is the Acer Iconia the opening salvo of a new generation of keyboard-free notebooks or just a grand experiment doomed to be a footnote in the annals of PC history? It’s certainly too early to tell, but there’s one thing that can be said about the new dual-touchscreen unit: It’s just darn cool. With no visible moving parts other than the hinge connecting the two bright 14-inch touchscreens, the Iconia is a sleek, clean-looking computing machine with nifty enhancements to the standard Windows interface. You can navigate through your browser, word processor and other software with your finger as you would on an Apple iPad or other tablet, but if you lay both palms upon the lower touch screen, a full size keyboard appears, including a virtual touchpad, thus allowing you to work as if it were a conventional notebook. The unit, and a handful of other new mobile devices, was introduced by Acer Tuesday at a spiffy New York press event which included a white runway more suited for fashion models than computer company executives. Both of the LED-backlit14-inch LCD touchscreens offer a resolution of 1,366 by 768 pixels and come with a protective layer of Gorilla Glass, a scratch and crack-resistant composite glass developed by Corning, which is based appropriately enough in Corning, New York. The full-size keyboard not only offers all of the keys of a standard keyboard, but can do some tricks that a hardware keyboard can’t. For example, once you touch the virtual touchpad below the virtual keyboard, the entire bottom screen becomes your touchpad as long as you don’t lift your finger. Instead of dragging your finger in short bursts across a two-inch square, you can use the entire real estate of the 14-inch display to propel the cursor around the top screen. Touching the keyboard with five fingers and then giving the screen a twist causes the Acer Ring, a circular, scrollable group of one-touch application cards, to appear. In practice the keyboard worked fairly well, requiring no more practice than one would need to use the virtual keyboard on an iPad or other tablet. The lower section can be used for generously sized system configuration screens–a boon for those with aging eyes. The lack of a hardware keyboard allows for a very slim profile and of course, a very quiet notebook. The unit will be built with Intel’s i5 family of processors, but other configuration information wasn’t immediately announced. A key question went unanswered Tuesday: The price. Acer officials said it had not been finalized yet. While Acer said that the unit may be available as soon as late this year, no sale date was given. So is this the beginning of the end of the keyboard as we know it? Not quite. The lack of haptic feedback or the reassuring bounce-back of a physical keyboard may cause even good touch-typers to constantly look at the virtual keyboard instead of the screen. However the Iconia’s dual screens brings the concept of a lightweight, but very rugged notebook with a weatherproof display and keyboard closer to reality. So the question is: Would you buy something like this as your primary laptop? Chime in. First it was beige, then it was black and now the color of today’s notable notebooks depends on which way the fashion winds are blowing. Samsung is hardly a stranger to this trend and proves it with a raft of sleek-looking notebooks poised to debut exclusively at Best Buy on Sunday. At a press preview in New York Thursday, Samsung showed off its new R80 series notebooks, which feature the company’s Crystal Wave body design. A clear coat protects a colorful metallic shell with wavy designs etched in. The result, according to a Samsung representative, is a durable case which will still looks good after hard use. Samsung’s R780 ($930), R580 ($830) and R480 ($730) notebooks come with 17.3-, 15.6- and 14-inch HD LED displays respectively and 500-gigabyte hard disks. The R780 and R580 come with muscular Intel Core i5 processors and high-end nVidia GeForce GT 330M or 310M graphics engines while the R480 uses a less-robust, but certainly adequate Intel Core i3 processor and a medium-strength Intel GMA 4500MHD graphics chipset. Somewhat surprisingly, the R480 and R580 come with Blu-ray players while the R780 is outfitted with a DVD burner. All of the R80 series units are long on connectivity options, offering three (R480) or four (R780, R580) USB 2.0 ports in addition to HDMI, video, audio, gigabit Ethernet, memory card and ExpressCard slots. The new units also feature built-in webcams, microphones and Wi-Fi adapters and the R780 includes a Bluetooth adapter as well. 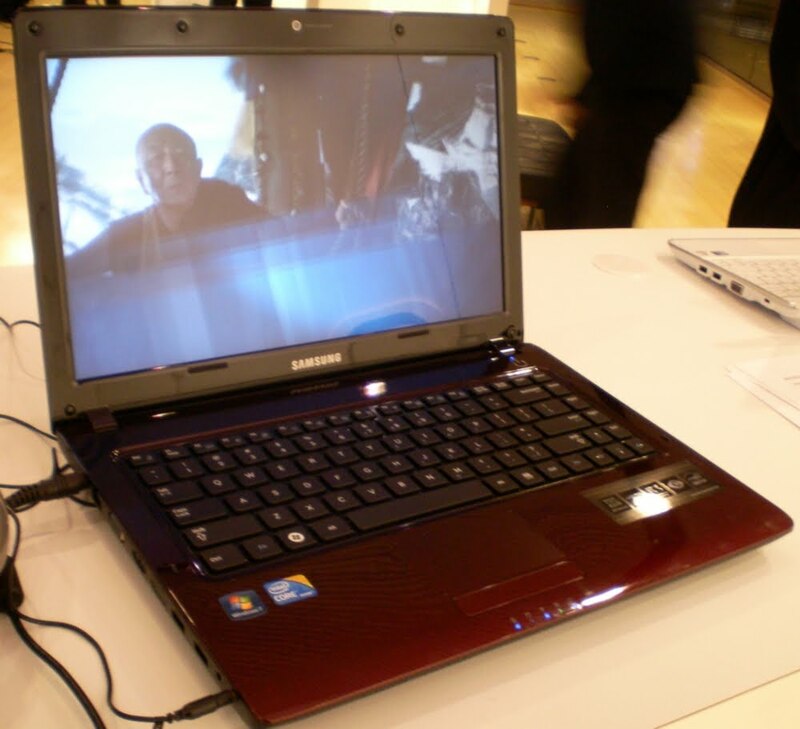 During an assortment of demonstrations at the Samsung Experience at the Time Warner Center in New York, Samsung representatives demonstrated how the Blu-ray-enabled R80 notebooks could send HD video feeds to nearby televisions while having enough processor and graphics muscle left over for notebook users to surf the Web, edit documents or perform other tasks without cyber hiccups. The R480 and R580 notebooks will be available at Best Buy retail stores March 7 while the R780 will be available online only via BestBuy.com. A notebook from Nokia? What is the netbook world coming to? Maybe to a Best Buy near you … or at least Nokia hopes so. At a splashy press event in New York this week, Nokia introduced the Nokia Booklet 3G , its first foray into the already crowded notebook market. Not surprisingly, the 2.76-pound netbook focuses not on top-shelf processor power or on graphics muscle, but on connectivity and uptime, and in these respects it may succeed. The Booklet 3G ($299 with a 2-year data service contract) includes Wi-Fi and Bluetooth 2.1 support, but also includes a 3G HSPA wireless data modem for the AT&T Wireless network. A slot is provided for the necessary AT&T Wireless SIM card. The unit also promises 12 hours of battery life per charge. “It’s not 12 hours in the brochure, it’s 12 hours true battery life,” said Lars Boesen, senior director for OEM emerging market business development for Microsoft Corp. He noted that the Booklet 3G comes with Microsoft’s upcoming Windows 7 operating system, which is optimized for the 1.6-gigahertz Intel Atom Z530 processor at the heart of the unit. Windows 7 will go on sale Oct. 22. He said the unit comes with just a small suite of preinstalled software, thus allowing the user maximum use of the Booklet 3G’s 120-gigabyte (GB) hard disk and 1GB of RAM. Also missing is a fan, he noted; the Booklet 3G doesn’t need one. The 10.1-inch, 1280-by-720 pixel display was bright and sharp, but that resolution proved too low for some Web sites, like the newest version of Yahoo! Web mail. The site bumps users who come in at too low a screen resolution back to the less-glitzy “classic” version. As small as the 0.8-inch thin unit is, it still has room for three USB ports, an HDMI port, a combination microphone/headphone jack and an SD Card slot. Just above the screen is a 1.3-megapixel webcam. You can access the 3G data network directly with the Booklet 3G or via a Bluetooth connection with a cell phone. You can also synchronize your contacts, calendar entries, tasks, photos and other data between a cell phone and the unit via a Bluetooth connection. Boesen noted that the unit could move smoothly from a 3G data connection to a Wi-Fi connection without interupting the user’s Internet experience. The Booklet 3G, available in black, white or blue, will be sold exclusively at Best Buy until the first week of January 2010, when other stores will offer it, said a Best Buy representative. He said demonstration units would begin appearing in stores Oct. 25, at which time pre-orders would be taken. The units will ship about Nov. 15, he said. The AT&T Wireless Web site will begin selling the unit Oct. 22. The Booklet 3G is $599 if purchased without a data plan. But a notebook from Nokia? 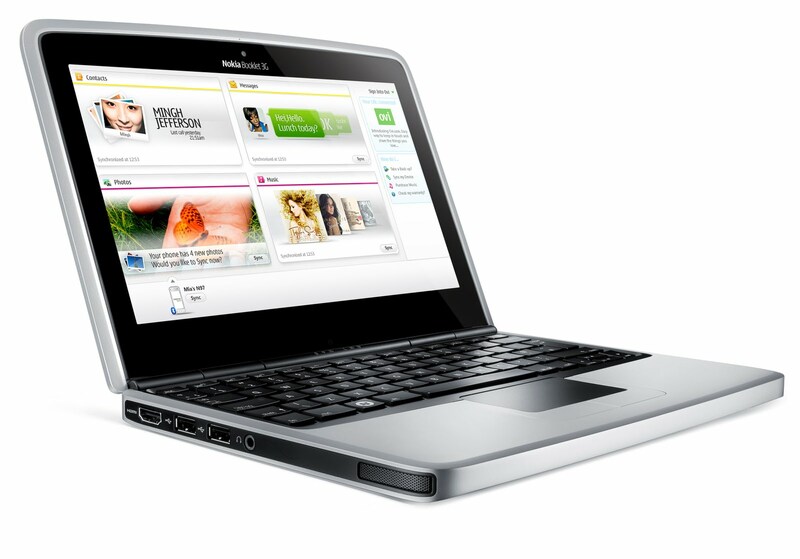 Can it succeed in a market already laden with nifty low-priced netbooks? It certainly will be tough. Then again, many of us gurgled and laughed a few years ago when Apple announced it was entering the cell phone market with something called an iPhone.